It’s March! So that means spring MUST be just around the corner, right? 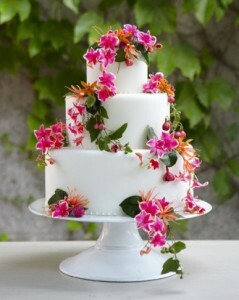 Well I’m convinced that the snow has to end soon so I’m showcasing spring wedding cakes today. And this all-white cake with cascading fresh flowers is perfect for a spring wedding! The wedding cake itself is a classic and elegant three-tier white fondant cake. On its own, the cake would be pretty but boring. But when you add a splash of bright colors with fresh flowers it changes everything! And while you could use big, bold flowers on this cake I really love the look of the small flowers. It gives the cake an air of elegance that big flowers wouldn’t. The flowers here are fuchsias and mini orchids but mini roses would be gorgeous too!